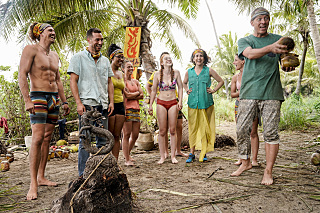 "It’s Sink (When You Can’t Swim) for Weak Contestant"
When one tribe is dancing even before tribal council, you have a pretty good feeling who is going to win, and that was definitely the case on Survivor this week. Okay, I’m fine with it. Actually, the second sentence is poorly worded and it irritates me because overcome is a bad way to end that sentence… But otherwise I’m fine with it. Actually, the sign itself is designed to look so old, but it of course is not old so it comes off as a poorly executed middle school art project. So I’m not fine with much of this. Even raising a white flag might be more appropriate than raising a sail on a beached and broken boat. Beyond that disappointment, there’s nothing else learned about the Edge of Extinction. (Sadly, still no dinosaurs. And this week, no creepy music). All I could think is the producers really really thought that one of the four veterans would get voted out first (because contestants wouldn’t be that stupid to keep them in the game--but they did--and Reem does not make for captivating TV--so we have to wait for something or someone more interesting to appear on The Edge of Extinction to get any more information about it. Reem just mopes about and even Survivor producers can’t make that look interesting. Back in the world of the other 18 Survivors, everything else seems quite well. 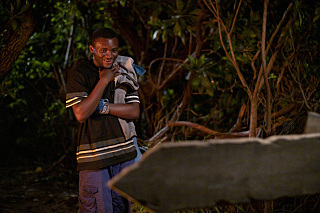 On Manu, Wendy continues to target Kelly, who seemed instead to solidify most of the tribe behind her and tried the idea of an “open idol hunt” with her own allies to prevent Wendy from finding one. Kama continues to be Kama (which means, like last week, got less screen time, all but assuring viewers they wouldn’t be going to tribal council). Ron leads the tribe in a totally terrible dance that looks like a version of YMCA gone horribly wrong, but Aurora and the rest of the tribe comment how it has brought the tribe even tighter...until veteran Aubry sourly notes (in a private interview) that she’d rather be voting people out from her own tribe since then she could tell where the true alliances are! (Harsh, Aubry!) What happened to the Aubry who promised last week she was going to be more caring and social and happy? Well, cold-hearted Aubry makes much better TV, so this is a good thing, but we sadly didn’t get to see enough of it. Back on Manu, Lauren gives a baffling speech about hoping to find an idol because her role models growing up (Parvati, Kelly Wentworth) found idols and voila! she finds a hidden idol. She said she’d definitely keep it to herself and not share it with anybody (which sounds suspect - I give her one more episode tops). Jeff welcomes the Survivors to another hybrid (water-sand) immunity contest that is a repeat of one several seasons ago involving swimming to a cage in the water, scaling it, releasing a giant snake, taking it to shore, undoing approximately 1588 knots (possibly an exaggeration but it takes a long time) and then using rings and things to solve another puzzle. The prize includes a choice of spices and knives (obviously to stab your most annoying contestant in the middle of the night?) or deluxe fishing kit which promises potential seafood buffets to the “skilled” fisher-folk. Once the challenge begins, Jeff announces how Manu is falling behind because “Keith is struggling” in the water “like last time” which already sounds like the kiss of death if his tribe loses. It gets to the ring stage and Kama’s Eric and Joe perform wonderfully while Manu’s Keith flails and mis-fires several rings before his team replaces him with Chris…. But it’s too late, and Kama wins for the second straight week. They could choose the spices and knives (but strangely, they don’t hate anyone yet because of the YMCA dance) so they choose the fishing kit to the disappointment of all viewers who had “random knife wound” in their Survivor office pool. The losers head back to camp and immediately it seems that the poorest swimmer, Keith, is destined to be voted out (and given a consolation prize of three months of swimming lessons!). Rick and Chris, however, wonder if instead they could make a big move and get rid of Kelly. David seems to like the idea because he doesn’t think the tribe is big enough for two veterans. Dan uses baffling logic of “what if there’s a merge” and “she’s a bigger target” to somehow argue to maybe keep Kelly in the game and the mini-alliance reconsiders options as they head to tribal. But it’s pretty clear from the conversation that this tribe wants to win, and that doesn’t bode well for America's favorite non-swimmer. So Keith becomes the second player voted out…or is he? My take on the emotional breakdown we just witnessed here is that Keith had really talked himself out of the game, so instead of being overjoyed at the option to stay he was looking for a sign (and not the literal one in front of him but a heavenly one) to tell him to stay in the game. 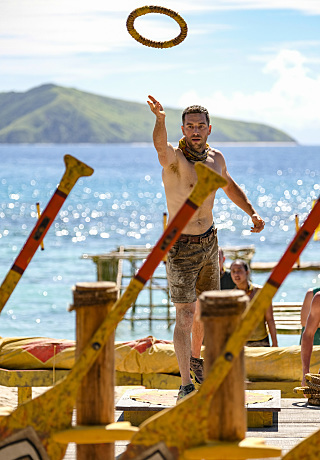 While I don’t discount that may be important, it also doesn’t bode well for him since it seems a true Survivor competitor would be so willing to take any chance to stay in the game it seems oddly soft that a contestant just voted out stands and considers for a long time whether to re-enter the game. After all, there hasn’t been a shortage of food, a flood, a sickness, or any terrible conditions yet. So the curtain falls (sort of) on Keith just standing there muttering up prayers to heaven. So it seems we need to wait another week to see what happens if two contestants head to the Edge of Extinction at the same time. No idol play. No twists and turns. A relatively straight forward vote-off… All in all, a pretty standard episode this week. Let’s hope things get more interesting in episode 3.